India’s economic performance since the start of the 21st century provides grounds for both optimism and concern; which assessment prevails will likely turn on the policy choices made today and in the next few years. India experienced the most sustained period of rapid growth in its economic history during the 2000s – an average of close to 9% a year between 2003/04 and 2010/11 – even taking into account a brief but sharp slowdown in 2008/09, during the global economic crisis. Rapid growth in the 2000s contributed to an unprecedented fall in poverty. The poverty headcount rate (using the national poverty line) fell from 37% in 2004/05 to 22% in 2011/12, an extraordinary decline over so short a period. More recently growth slowed to only around 5% in 2012/13. Recent data provide inconsistent evidence as to the extent of the recovery from this slowdown. Cross-country analysis suggests that, while many countries enjoy temporary growth booms, this is nearly always followed by a “reversion to the mean” and more mediocre growth. For India to join the select group of countries that achieve sustained rapid growth over several decades will require policy-makers to provide a relentless focus on finding and unblocking the critical obstacles and constraints to structural change and inclusive growth. A second, broader concern is that the benefits of faster GDP growth in recent years are being undermined by unplanned harmful spill-overs from the current growth model – severe local air pollution and damage to health, rising energy insecurity due to an increasing share of coal and other energy imports, excessive drawdown of groundwater in agriculture, and the costs of a rapid but problematic urbanisation, such as periurban sprawl, congestion, pollution and reduced urban productivity. Thus, even as it grapples with the problems of how to achieve rapid and inclusive economic growth, India also has to ensure that growth is sustainable – that its natural assets are able to continue providing the resources and environmental services on which the well-being of present and future generations depends. Some 2 million (or over 20%) of all premature deaths in India in 2010 were related to some type of environmental risk. Of these, the most important is household air pollution from burning solid fuels, which is estimated to be responsible for just over 1 million premature deaths. Some 49% of households in India rely on firewood for cooking, especially in rural areas. In poorly ventilated buildings, indoor smoke can be 100 times higher than acceptable levels for small particles. The health risks are especially great for women and girls who do most of the cooking. A major push to expand access to electricity and provide improved cleaner cookstoves will therefore have a significant co-benefit in terms of reduced illness and deaths from household air pollution. Outdoor (ambient) particulate matter (PM) pollution caused an estimated 630,000 premature deaths in India in 2010. 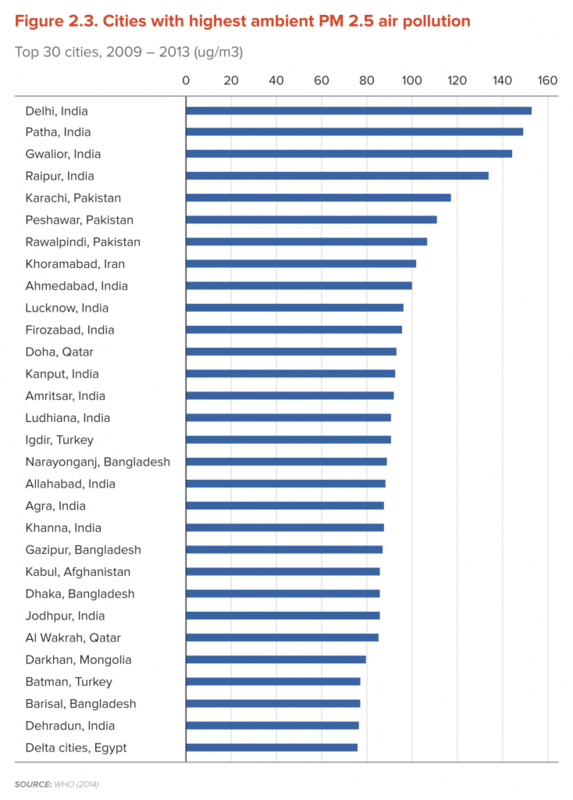 Of the 30 cities with the worst ambient PM2.5 pollution worldwide, 15 are in India, including the top four. Estimates place a statistical value of lives prematurely lost annually in India due to ambient PM2.5 pollution at 5.5–7.5% of GDP. Since PM2.5 pollution and CO2 emissions both come largely from the same source – the burning of fossil fuels – it is important to consider the large health benefits from reduced air pollution associated with abatement of CO2 emissions. For India these benefits are estimated at US$55 per tonne of CO2 abated, close to double the US government’s estimate of US$32 per tonne for the climate change benefits of reducing CO2 emissions. Importantly from the perspective of Indian policy-makers, the air quality benefits are not only larger, they are enjoyed in the near term; accrue locally, mostly to the country itself; and are more certain compared with climate change benefits. In the remainder of this paper we argue that key reforms in energy, urban and agricultural policies and institutions can unlock more rapid economic growth and improved welfare for the Indian public while tackling many of the unwanted national side-effects of the existing model of growth, such as severe air pollution and growing energy insecurity. Such reforms also provide substantial avenues for India to make its due contribution to cooperative global efforts to mitigate greenhouse gas (GHG) emissions, and climate risks. India consumes a relatively small amount of energy in both absolute and per capita terms compared with other major economies such as the OECD (Organisation for Economic Co-operation and Development) countries or China. But energy consumption is growing rapidly, at 4.6% per year in 2000–13, which represents a doubling in 15 years. This growth can be broken down into 7.2% annual GDP growth, minus about 2.6% annual decline in the energy intensity of GDP. Growth in energy demand in India is likely to remain robust, not only because of fast economic growth but also because of structural trends, such as increasing industrialisation and urbanisation, which tend to boost demand. Unlike China, much of India’s manufacturing development still lies in the future. 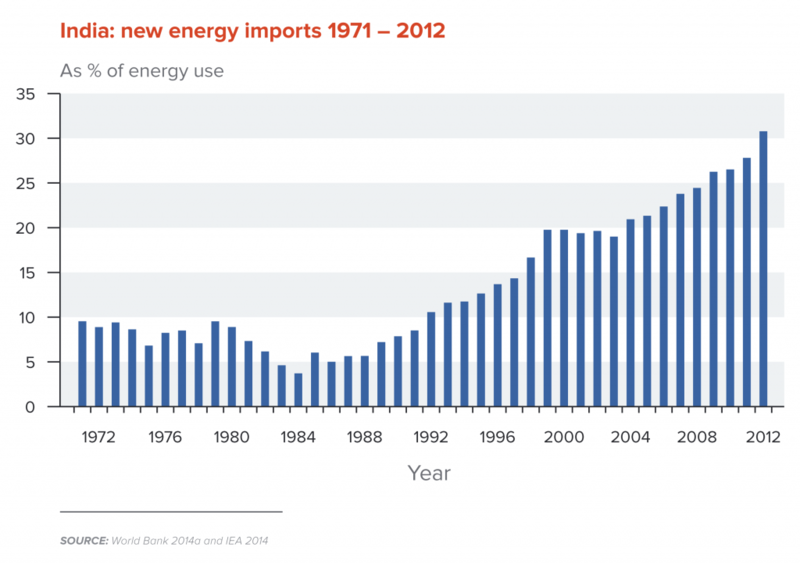 Domestic energy production has not kept pace with quickly rising consumption, so that energy imports have surged. Energy has become central to the country’s chronic trade imbalance, with rising energy insecurity an important concern for policy-makers. India’s international trade deficit for fuels averaged an annual 6.4% of GDP over 2008–12 – twice the size of its current account deficit, which averaged 3.2% of GDP annually in this period. The current account deficit has fallen recently, in part because of lower world oil prices. The country’s external position nevertheless remains vulnerable to volatility in energy prices. These trends underline the importance of reforms to reduce unnecessary existing inefficiencies and waste in energy use. Alongside fast growth in energy demand, India’s energy supply has also become steadily more carbon intensive as the share of fossil fuels has risen, in particular with growing use of coal for electricity generation, and diesel and gasoline for transport. The combination of fast growth in energy demand and the rising carbon intensity of energy has resulted in the rapid increase of CO2 emissions from energy use, averaging a little over 5.5% a year, as well as severe outdoor air pollution. Indeed, the increase in CO2 emissions appears to have accelerated in recent years (2007–13). As a result, the long-term decline in the ratio of CO2 to GDP appears to have slowed or halted recently. This is important because India’s voluntary international commitments for emissions are couched in terms of a long-term decline in the ratio of emissions to GDP. There are several directions in which India’s mission to enhance energy efficiency and achieve a cleaner fuel mix can be intensified and broadened in scope. As in a number of other countries, fuel and power subsidies in India originated from a desire to protect consumers, and the poor in particular, from high and volatile energy costs. But there is a clear recognition that energy subsidies are an inefficient way of providing social protection, while also imposing significant costs on the economy and harm to the environment. Fuel subsidies are estimated to have averaged 1.4% of GDP since 2007/08. Recognising their costs, the Government of India has recently moved to reduce or eliminate fuel subsidies, as well as to raise excise taxes on petrol and diesel. The fiscal burden of fuel subsidies will also decline because of the steep fall in world oil prices in the second half of 2014. In the absence of reforms, though, the fiscal burden would increase again as and when oil prices rebound in future. And, whether prices are high or low, oil price volatility itself increases macroeconomic uncertainty, makes budgetary planning more difficult, increases risk premiums and hurts private investment and growth. The present oil price decline provides an excellent opportunity to accelerate the removal of the remaining fuel subsidies and to place the reforms of recent years on a permanent basis at a time when the impact on consumers will be limited. India’s electricity sector is rife with inefficiencies and supply bottlenecks that result in huge unmet demand, hamper economic growth, restrict access by the poor, stimulate inefficient energy consumption and worsen both local air pollution and carbon emissions. Extremely low subsidised electricity prices for agricultural users do little for agricultural productivity while stimulating excessive groundwater use and GHG emissions in agriculture. The electricity sector also suffers from extraordinary transmission and distribution losses, some 21% of electricity output in 2011, compared with just 6–7% in China and the USA. Financial losses in the electricity sector have snowballed since 2003, reaching 0.7% of GDP and 17% of the gross fiscal deficit in 2011. Losses have been met by state subsidies and, increasingly, debt borrowings, which have reached more than 10% of state GDP in several northern states. Mounting power sector debts now pose a threat to the balance sheets of financial institutions. Worsening finances in the power sector have, in turn, led to increased rationing of power supplies and a squeeze on new investment, further reducing the quality of power infrastructure and services – a vicious circle. The 2005 World Bank Enterprise Survey for India found that one-third of firms saw power shortages as the single most important constraint on their growth. Power subsidy reform, while difficult, is not impossible. In Gujarat, for example, large farmers were recently willing to accept higher power prices in return for a more reliable power supply. India’s energy fuel mix is also far from socially optimal, once the harmful spill-overs from coal and other fossil fuels are taken into account. For example, air pollution damages and growing energy insecurity. One recent estimate suggests that the price of coal in India needs to at least double if it is to fully reflect the health and other damages associated with coal use. Yet the share of coal in total primary energy has increased from 33% in 1990 to 45% in 2012, accompanied by a rising share of expensive, foreign currency denominated coal imports for power generation. As in the rest of the world, the cost of renewable energy has seen an unexpectedly rapid decline in recent years, some 65% over the last three years by one estimate. The price of imported coal could be 30–50% higher than the cost of wind and solar by 2030. Replacing the marginal unit of energy supply from imported coal with a marginal unit from financially competitive renewable energy would allow India to secure substantial additional social benefits, such as greater energy security and a cleaner environment. Wind and solar capacity is small but rising fast. Government targets for renewable capacity are being sharply increased but still remain far below estimates of the physical potential for solar and wind in the country. Agriculture remains an important sector of the Indian economy, providing almost half of all employment, with over two-thirds of the population still living in rural areas. From a heavy dependence on foreign food aid in the early decades after Independence, agricultural development has advanced sufficiently for India to become first self-sufficient and then a net exporter of food. However, while there has been substantial progress in improving the productive capacity of Indian agriculture over the decades since Independence, the rate of improvement has been relatively modest by international standards. There has been some acceleration in growth of the overall agricultural sector since the mid-2000s but, among other reasons for caution, productivity performance for traditional crops is lagging. Agriculture remains vulnerable to existing climatic variability and future climate change, while also driving rapid growth in groundwater extraction, something that threatens the long-term economic sustainability of the sector. Through direct and indirect channels, agriculture also generates about 30% of India’s GHG emissions. Given this backdrop, we argue that there are significant reform opportunities to achieve “triple wins” – that is, to raise farmers’ incomes, to strengthen resilience to climate change and to abate GHG emissions – in particular by improving the orientation of public spending on agriculture. While there is no single, comprehensive source of information, studies suggest that the total volume of public spending on agriculture is significant and growing. The largest category of spending is on subsidies for fertiliser, power, irrigation and credit, significantly exceeding spending on rural infrastructure and agricultural research and development (R&D). Yet evidence suggests that the economic returns on agricultural subsidies are close to zero, while those for rural infrastructure and agricultural R&D are very high. 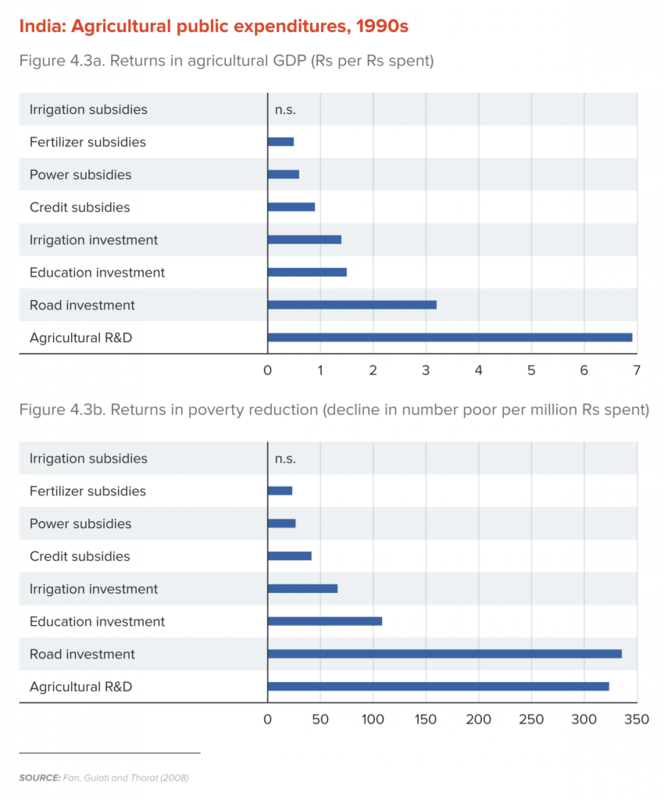 Public R&D spending and investment are also much more powerful than subsidies for the purpose of rural poverty reduction. Not only is the present orientation of public expenditure in agriculture unhelpful for economic productivity, but it also discourages environmental sustainability. This is because agricultural subsidies tend to promote both excessive use of water as well as GHG emissions through a number of related channels. Power subsidies, for example, stimulate both high power consumption and high GHG emissions, as well as lift irrigation using tube wells, which causes excessive drawdown of groundwater and depletion of water tables. Agriculture accounts for 90% of annual freshwater withdrawals, a proportion that is unusually high by international standards and that has hardly fallen over recent decades, despite the gradual decline in the relative importance of agriculture in the economy. Overall, freshwater withdrawals now absorb over 50% of internal renewable water resources, a proportion that has risen from about one-quarter in the later 1970s. Livestock is another agricultural sector with significant potential economic and environmental gains. India has one of the largest livestock herds in the world. Productivity is generally low, however, with average milk yields about half of the world average for example. Meanwhile, methane emissions from livestock are the largest source of agricultural GHGs in India, an outcome made worse by poor diet. There appear to be significant opportunities to boost economic returns and curb emissions by promoting better feeding and animal reproduction management to bring about a smaller, more productive herd. Opportunities to expand forest cover also offer significant opportunities for increased carbon sequestration, groundwater recharge and employment opportunities for forest communities. The Government of India has rightly focused on the potential of “smart cities” as an important driver of development. The New Climate Economy report provides evidence for this proposition by detailing how more compact, connected and well-coordinated cities promote both development and greater energy and pollution efficiency, for example through agglomeration economies: the forces through which a more dense clustering of individuals and firms in urban areas promotes more innovation and faster productivity growth. Unfortunately, there are few automatic guarantees that urban development will necessarily evolve in this way. Market failures, policies and weak institutions can lead to much less productive and less clean outcomes. India’s urban population almost doubled from 222 million in 1990 to an estimated 410 million in 2014 and is expected to reach 800 million by 2050. Cities now contribute over two-thirds of GDP, bring in over 90% of government revenue and contribute the majority of jobs. But the pattern of urbanisation is also one rife with numerous stresses and dysfunctions: rapidly expanding periurban sprawl, inadequate and unreliable urban infrastructure, high land prices, proliferating slums, growing congestion and travel times, reduced agglomeration economies, intense local air pollution and rising GHG emissions. Rapid urban growth is occurring on many different margins and frontiers. Some of the most explosive growth is occurring in peri-urban areas, on the periphery of existing big cities. Restrictions on building per unit of land reduce the intensity with which city land is used, pushing up land prices, reducing average floor space and pushing businesses and households to seek cheaper land further and further away from city centres. Mumbai homes have only about 30 square feet per person, compared with 140 square feet per person in urban China, for example. The dysfunctional patterns of urbanisation in India arise from a number of long-standing, deeply ingrown and mutually interlocking policy distortions and institutional weaknesses. Highly restrictive land regulations cause intense pressures for urban sprawl. Floor space indexes, which regulate the maximum allowable ratio of the gross built-up floor area to the area of a plot, are generally far lower than in many of the most economically dynamic and prosperous cities in the world, such as Shanghai, Hong Kong, New York and Tokyo. Rent control laws and the lack of a well-developed housing finance system also constrain the supply of new housing stock. Efficient functioning of land markets is also hampered by weak systems for appraising land values, determining property rights and conducting public land acquisitions. Yet proposals to build more compact cities are countered by concerns that greater densities in urban cores would overwhelm the rickety and inadequate existing infrastructure of urban areas in terms of water supply, sewerage and sanitation, access to electricity and public transport. In 2011 only 61% of urban households had access to treated tap water. Among major Asian cities, Chennai and Delhi were ranked the two worst cities for hours of water availability. Clearly, a vast upgrading in the scale and quality of urban infrastructure is needed if India is to fully tap the potential of its cities. Efforts to strengthen urban infrastructure and planning are in turn hampered by the weaknesses of urban governance and institutions. The Constitution defines 18 functions for devolution to the local government level. In practice, however, the allocation of responsibilities between various levels of government remains muddled. Local governments’ administrative capacity and accountability to residents is limited at best, while their fiscal resources remain far below the levels needed to accomplish their tasks. The government’s intention to massively expand urban investment on “smart cities” provides a tremendous opportunity to simultaneously tackle these interlinked issues. In recent years the Jawaharlal Nehru National Urban Renewal Mission (JnNURM) has represented a major effort by central government to significantly increase the volume of resources for urban infrastructure development, while also encouraging policy and institutional reforms to improve the effectiveness with which such resources are used at both the state and urban local government level. A thorough impact evaluation of the JnNURM can help to lay the basis for a renewed and comprehensive urbanisation strategy in India. We highlight 11 policy recommendations that can significantly increase the pace of improvement in the well-being of the population of India while also better tackling environmental and climate risks. The political economy of such reforms is often difficult but experience from both India and other countries provides considerable hope that meaningful progress is possible. Complete fuel subsidy reforms: The recent steep fall in world oil prices provides an excellent opportunity to complete a comprehensive fuel subsidy reform that is sustainable over the long term, coupled with well-designed and targeted measures to protect the poor and those vulnerable from higher fuel prices. Complete electricity sector reforms: Reforms begun in the Electricity Act (2003) need to be pushed forward to unbundle and corporatise state electricity boards, build independent regulatory bodies, reform power subsidies and set realistic prices to create financial viability. Insulating distribution companies and regulatory bodies from political interference by state governments is a vital dimension of such reforms. Promote energy efficiency standards: The tightening of mandatory energy efficiency standards for appliances, vehicles and buildings can play an important role in improving energy efficiency and reducing harmful emissions using available cost-effective technologies. Use fuel taxes to promote a more efficient fuel mix: The most efficient instrument to curb excessive consumption of coal and other fuels with large harmful spill-overs are fuel taxes that reflect the pollution and other harms caused by each fuel type. Such taxes also promote energy efficiency and clean energy innovation, while generating substantial fiscal revenues, potentially 6–7% of GDP in the case of India. Policies to reduce the high cost of finance for renewable energy: Initiatives to reduce the present high cost of finance can have an important impact in stimulating private investment in renewables, for example through increased flows of concessional development financing. Such reforms can more than pay for themselves by significantly reducing the subsidy required per unit of renewable energy produced.The creation of a National Renewable Power Corporation should be considered, which could undertake major renewable investments with world-class levels of management and technological dynamism. Restructure public spending in agriculture: Reorient public spending in agriculture away from subsidies for electricity, irrigation, fertiliser and credit and towards rural infrastructure, agricultural R&D and extension services – a change that would boost agricultural productivity, curb wasteful water use and reduce agricultural GHG emissions. Better livestock management: Stronger public action is needed to improve management of animal reproduction, health and diet, measures which lead to a smaller but healthier and more productive herd, and reduce both pressure on natural resources and agricultural GHG emissions. Scale up forestry initiatives: Existing initiatives to expand the quantity and quality of forest cover under the “Green India Mission” need to be scaled up. Reform land regulations: Highly restrictive floor space indexes need to be relaxed in line with those in dynamic international cities, to permit taller buildings and greater availability of built-up space for given land areas. Reform of rent controls, better systems to appraise land values and determine property rights and a stronger housing finance system are also needed. Expand and renew urban infrastructure: Without a coordinated expansion and refurbishment of urban infrastructure, the relaxation of land regulations would put even more pressure on already rickety and inadequate service delivery systems. A comprehensive impact evaluation of the Jawaharlal Nehru National Urban Renewal Mission (JnNURM) can lay the groundwork for a renewed and scaled-up urban investment and reform agenda. Reform and strengthen urban local government: A much clearer allocation of responsibilities is needed for urban local governments. Administrative capacity and accountability at the local level needs to be strengthened. Local government own revenues need to be bolstered, including through reform of property taxes. Intergovernmental transfers from the centre and the states to local areas also need to be boosted, together with better monitoring and accountability to ensure enhanced resources are well spent. India’s economic performance since the start of the 21st century provides grounds for both optimism and concern. Which assessment prevails will likely turn on the policy choices made today and in the next few years. 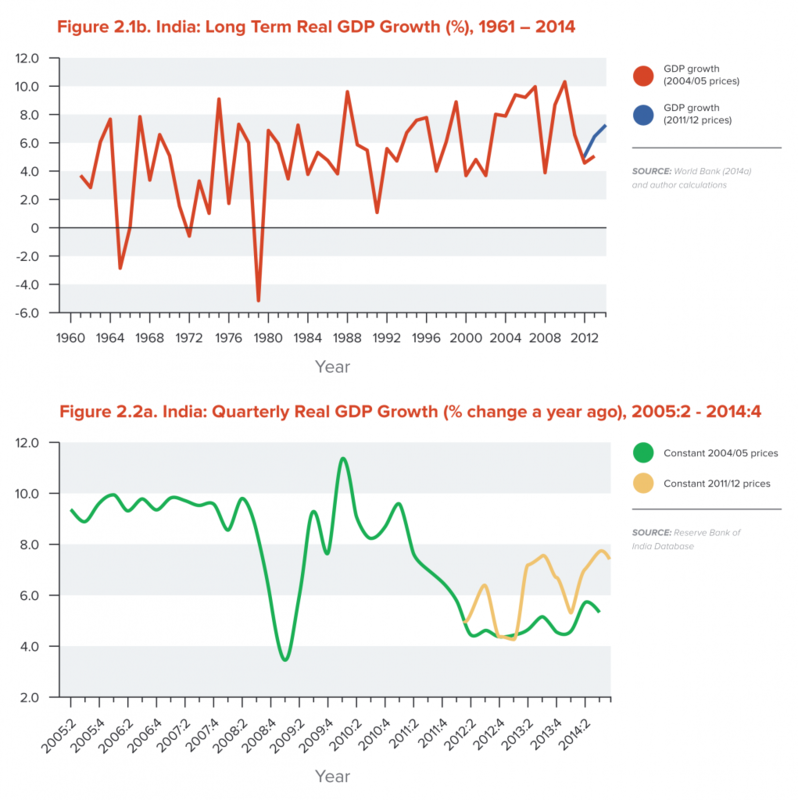 India experienced the most sustained period of rapid growth in its economic history during the 2000s – an average of close to 9% a year between 2003/04 and 2010/11, even taking into account a brief but sharp slowdown in 2008/09 during the global economic crisis (see Figure 2.1a). The growth boom in the first decade of the century came after several decades of gradually increasing growth, from less than 4% in the 1960s to 5–6% in the 1980s and 1990s, raising hopes that the country might have entered into a period of sustained growth in the 7–9% range (see Figure 2.1b). a. Reserve Bank of India Database. These hopes for a breakthrough to sustained ‘East Asian Miracle Economy’-like growth in India have been thrown into doubt by a significant slowdown from 2011/12 onwards. Growth slipped below 7% in 2011/12 and then to around 5% in 2012/13. Fixed investment spending growth in particular slid to only 1–2%, accompanied by perceptions of a stalling in reform momentum, increased policy and regulatory uncertainty, electricity and other infrastructure bottlenecks, and increased macroeconomic volatility, reflected in higher inflation and wider fiscal and balance of payments deficits. External conditions were also difficult. Growth in developed country export markets has remained sluggish after the financial crisis. Private capital flows have been volatile, with prospects of a gradual tightening of US monetary policy causing large capital outflows and exchange rate depreciation in many emerging markets, including India, in 2013. This discussion suggests that for India to increase its odds of returning to high growth, it will need a relentless focus by policy-makers on finding and unblocking the critical obstacles and constraints to structural change and inclusive growth. In the remainder of this paper we argue that key reforms in energy, urban and agricultural policies and institutions can unlock more rapid economic growth and improved welfare for the Indian public while tackling many of the unwanted side-effects of the existing model of growth, such as severe air pollution and growing energy insecurity and climate risks. Later sections of this report argue that there are numerous cost-effective opportunities to strengthen resilience to climate change and adaptation capacity in agriculture and the economy more generally. Similarly, there are substantial avenues for India to make its due contribution to cooperative global efforts to mitigate GHG emissions, while pursuing its overriding commitment to development and rapid poverty reduction. Rapid growth in the 2000s contributed to an unprecedented fall in poverty. The poverty headcount rate (using the national poverty line) fell from 37% in 2004/05 to 22% in 2011/12 (see Figure 2.2a). The average annual pace of decline in the poverty rate during this period was 2.2 percentage points, three times faster than it was between 1993/94 and 2004/05. The accelerated decline in poverty occurred in both rural and urban areas. The decline in rural areas – where four-fifths of the poor live – was indeed even more rapid than in urban areas. For the first time there was also a large decline in the absolute number of poor (see Figure 2.2b). Alongside these two central problems – how to achieve rapid economic growth and to ensure that it is broad-based and inclusive – India is also necessarily grappling with a third, to ensure that growth is environmentally sustainable. Even as its economy expands, India needs to ensure that its natural assets are able to continue providing the resources and environmental services on which the welfare of present and future generations relies. By one incomplete estimate natural assets comprised about 26% of India’s total asset stock in 2005.16 Yet, as in other countries, market and policy failures often result in natural assets being depleted at an excessive rate, or in natural assets such as clean air and water becoming excessively polluted, resulting in reduced national welfare. Better policies can help the country improve national welfare by reducing excessive local pollution and inefficient natural resource use while still sustaining economic growth. Efforts to reduce local air pollution can yield significant co-benefits in terms of reduced GHG emissions. Depletion of natural capital in India takes a wide range of forms – erosion and degradation of agricultural soils, rapid depletion of groundwater resources (discussed further in Section 4 below on agriculture and land use), deforestation, destruction of biodiversity, and air and water pollution which cause increased illness and premature death, that is to say which deplete the country’s human capital. These depletions and damages are typically not captured in standard measures of economic welfare such as GDP and are often overlooked by policy-makers. The broad range of environmental damage and natural resource depletion in India has recently been surveyed in Mani (2014).17 Here we focus on environmental damage to health, in particular from air pollution. The Global Burden of Disease study by the World Health Organization (WHO) estimates close to 10 million premature deaths from various sources in India in 2010.18 Some 2 million of these were related to some type of environmental risk, principally household air pollution from solid fuels (just over 1 million deaths) and outdoor (ambient) particulate matter (PM) pollution (about 630,000), as well as smaller numbers related to unimproved water and sanitation, ambient ozone pollution and other risks. This means that air pollution risks are among the top risks to health in India, alongside, for example, dietary risks (1.6 million) and tobacco (1 million). There are also other serious costs in addition to premature mortality, such as chronic ill health, reduced effective time for work and leisure, and increased health system costs. Household or indoor air pollution from the burning of solid fuels – particularly traditional biomass such as firewood – using open fires and simple stoves for cooking and heating, is an especially serious source of illness and premature mortality in India relative to other countries. Some 49% of households in India rely on firewood for cooking, especially in rural areas. In poorly ventilated buildings, indoor smoke can be 100 times higher than acceptable levels for small particles. The health risks are especially great for women and girls who tend to do most cooking. The share of traditional biofuels in India’s total primary energy has been gradually declining as the country moves to modern energy sources, but it is still high by international standards, around 24%. A major push to expand access to electricity and provide improved cleaner cookstoves will therefore have a significant co-benefit in terms of reduced illness and deaths from household air pollution. Figure 2.4 plots national averages for ambient PM2.5 pollution for a cross-section of countries against their per capita GDP in 2010. 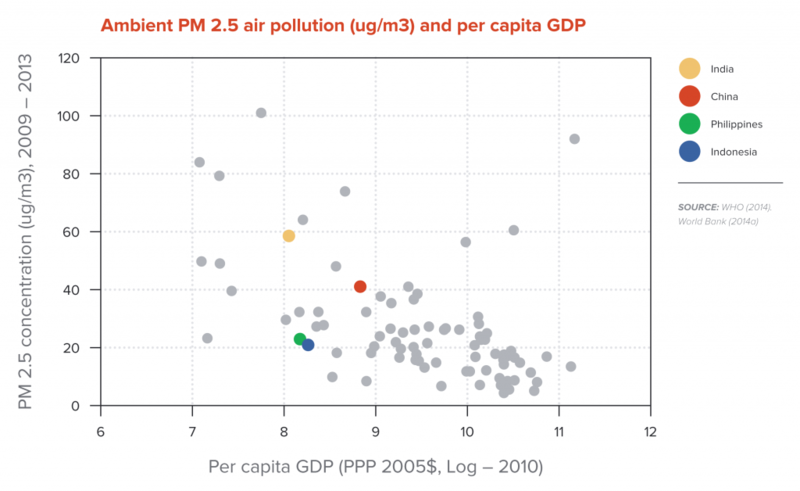 There is some tendency for countries with higher per capita incomes to have lower PM2.5 pollution. But there is also a wide range of pollution outcomes at any given income level. In particular, India’s PM2.5 pollution level is exceptionally high even for countries at or near its per capita income levels. Fast-growing lower- middle-income countries like Indonesia and Philippines, for example, have PM2.5 levels of about one-third those in Indian cities. This suggests that there may be considerable scope for better policies to reduce ambient air pollution, improve health and boost overall social welfare in India without significant costs in terms of productivity and output. With such high PM2.5 concentrations in its cities, it is not surprising that India also has a high estimated national rate of premature death from ambient PM pollution, 51 per 100,000 population in 2010, which puts it in the top 25% of countries. China, which has lower (although still high) concentrations of ambient PM2.5 in its cities (see Figure 2.4 above), has a higher estimated mortality rate from ambient PM2.5 than India, 92 per 100,000.25 One possible reason for this difference is that China is more urbanised than India, so that a higher proportion of its population is exposed to ambient PM pollution. China’s experience holds a stark warning for India: if it fails to significantly reduce its exceptionally high levels of PM2.5 pollution, India’s death rates from this risk source are likely to escalate sharply as the country continues its rapid urbanisation and industrialisation, and as an ever larger proportion of the population are affected by severe urban air pollution (see Section 5 below on cities). Since PM2.5 pollution and CO2 emissions both come largely from the same source – the burning of fossil fuels – it is also illuminating to calculate the monetary value of lives lost from PM pollution per tonne of CO2 emitted. With some caveats, this indicator provides an estimate of the potential health benefits per tonne of CO2 abatement. Studies for the New Climate Economy report estimate that for India such health benefits amounted to about US$55 per tonne of CO2 abated in 2010. This is close to double the US government’s estimate of US$32 per tonne as the climate change benefits of reducing CO2 emissions.27 These estimates rather significantly change the cost-benefit calculus of reducing CO2 emissions in India. First, adding the health benefits of reduced PM pollution almost triples the overall benefits from reducing CO2 emissions in India. Further, and importantly from the perspective of Indian policy-makers, the air quality benefits are enjoyed in the near term; accrue locally, mostly to the country itself; and are more certain compared with climate change benefits. By international comparison, India’s emissions of GHGs are relatively small in both absolute and per capita terms. But they are growing rapidly. CO2 emissions comprised 75% of India’s total GHG emissions in 2011, primarily from combustion of fossil fuels, with methane and nitrous oxide emissions contributing another 20% and 4% respectively. CO2 emissions are also the fastest growing of the major GHGs in India, reflected in a steadily rising share in total emissions. We discuss CO2 emissions from energy use in more detail in Section 3 below on energy. By global standards India consumes rather a small amount of energy in both absolute and per capita terms. Energy consumption is now growing at quite rapid rates from these low starting points, however, and demand for energy services is likely to continue to grow for several decades more if the country succeeds in achieving its goals of sustained fast economic growth and development. Yet efforts to meet even today’s relatively low levels of energy demand are already creating significant macroeconomic, financial and environmental stresses. This would appear to be an opportune time for a fresh review and rethink of how India is to meet its burgeoning energy demands in the decades ahead. India’s primary energy consumption was an estimated 815 million tonnes of oil equivalent (mtoe) in 2013, about 6% of world energy consumption, compared, for example, with the OECD and China’s respective 40% and 22% shares. In per capita terms, energy consumption was 643 kg of oil equivalent, one-third of the world per capita average, or 16% of the per capita level in OECD countries. Electricity consumption is even more limited compared with international levels – 683 kWh per capita in 2011, a little more than 20% of the world average and only 8% of the OECD average. Some 301 million people lacked access to electricity altogether in 2010, 25% of the population, the vast majority being in rural areas.32 As noted, lack of access to clean cooking fuels contributed to high levels of premature death and illness from indoor household air pollution. Even for those with access to electricity, power outages and blackouts are common. On 30 and 31 July 2012 severe blackouts affected over 620 million people in northern and eastern India, thought to be the largest outage ever worldwide. These international comparisons suggest that, as development proceeds, India’s demands for energy services and electricity are likely to rise dramatically from the present relatively low levels. Growth in India’s energy consumption has indeed accelerated in the 2000s, rising to a compound annual average of 4.6% in 2000–13 from 3.7% in the 1990s. An annual growth rate of 4.6% represents a doubling of energy consumption every 15 years. This pace was much more rapid than in OECD countries (where energy consumption actually contracted slightly in 2000–13), or in non-OECD countries other than China (where energy consumption grew on average 3.3% a year in this period). We can break down growth in India’s energy consumption in a simple way as the sum of growth in real GDP (a key driver of energy demand) and growth in the energy intensity of GDP (the amount of energy consumed per dollar of real GDP). Following this approach, India’s 4.6% annual growth in energy consumption in 2000–13 can be broken down into 7.2% annual GDP growth minus a 2.7% annual decline in the energy intensity of GDP, as shown in Figure 3.1. 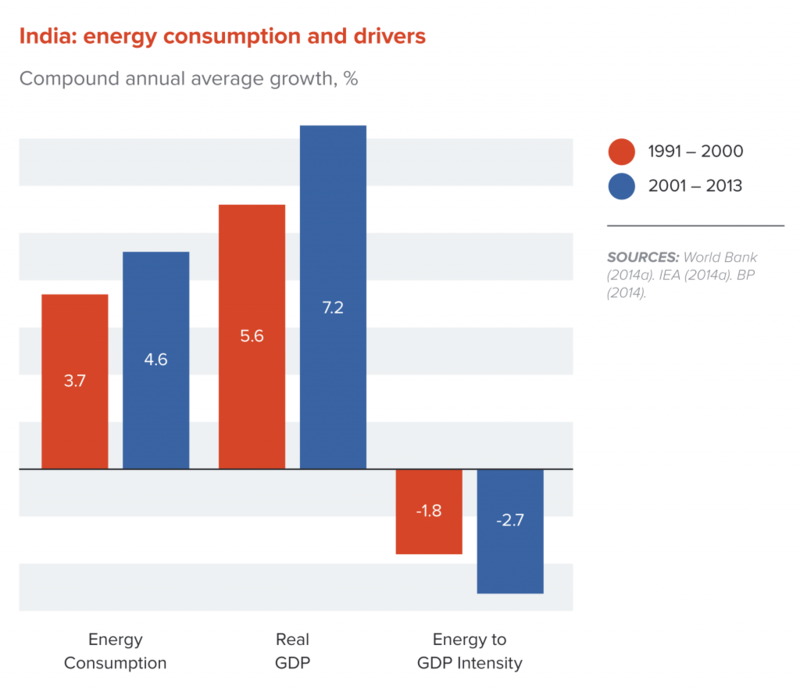 This figure indicates that the acceleration in India’s energy consumption in the 2000s was driven by faster GDP growth, which was only partially offset by a somewhat faster pace of decline in the energy intensity of GDP. The pace of decline in India’s energy intensity so far in the 2000s (2.7%) was higher than the median pace of energy intensity decline across all countries in this period, which was just under 1.5% a year. More worryingly, there appears to have been some slowing in the pace of the decline of energy intensity in India between the earlier and later parts of the 2000s: energy intensity fell at 3.5% a year in 2000–06, but at a slower 1.9% in 2006–13. Such differences can have a big impact over time. If the economy is growing at 7% a year, then energy consumption in 15 years’ time would be one-third higher if the pace of energy intensity decline were only 1% rather than 3%. The evolution of energy intensity is likely to have significant implications for the potential growth of the economy, the balance of payments, GHG emissions and the environment. Energy intensity of GDP in turn reflects a complex mix of economic, technological, sectoral and structural factors. These include, on the one hand, the technical efficiency of energy use within specific production processes and for the consumer goods used by households, something which is generally improving over time as a part of global technological progress. Actual energy efficiency is often well below the technological maximum feasible, however, because, for example, the costs of the best technology may simply exceed the benefits of using it. But energy efficiency may also be low because of policy distortions such as energy subsidies and a variety of other market and institutional failures that lead to energy consumption that is excessively high from the perspective of social welfare, and often even from the perspective of private profitability – the so-called energy efficiency gap.35 Section 3.2 below argues that there are substantial opportunities in India to improve energy efficiency in ways that would benefit both the economy and the environment. These broad tendencies of course do not mean that countries are doomed to follow a pre-determined path. Policy choices make an enormous difference. Nevertheless, in the absence of strong policies to manage demand and promote energy efficiency, it appears likely that many of these structural forces – industrialisation, urbanisation, falling poverty and rising energy access – could create pressures to push India’s energy intensity and energy demand higher in the years ahead. Figure 3.2 above shows that the share of industry in India’s GDP has risen slowly from 20% in 1970 to about 26% in 2012. The figure also shows some Asian comparators. Industry is 46% of GDP in China, an upper-middle-income country, although this is exceptionally high compared with other upper-middle income countries, and is a cause of concern to Chinese policy-makers, who view it as a source of imbalance and environmental stress in China’s development path. 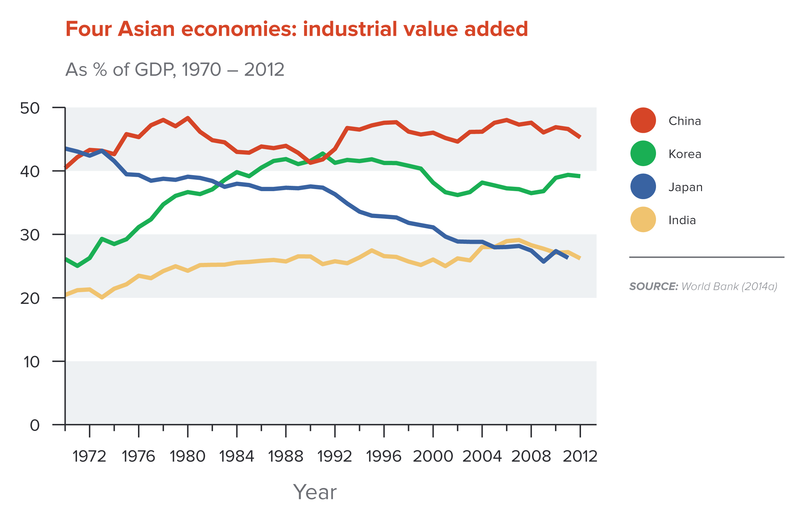 The industry share is also exceptionally high – just under 40% – in Korea, a high-income emerging economy. While India would probably not reach Korean or Chinese levels of industry share, there are reasons to think its industry share will nevertheless trend higher. Broadly, the historical cross-country pattern is for industry shares to rise, until per capita GDP levels are 2–3 times higher than they are in India at present. Industry in India is also likely to have been especially held back by some of the major economic distortions of the past and present, for example excessive government regulation and state ownership in industry; restrictive labour regulations and weak physical infrastructure and logistics. The relaxation of these constraints may benefit industry disproportionately going forward. Urbanisation (discussed in Section 5 below) will also remain buoyant. Energy sector reforms can play a major role in helping India to meet its development challenges. There are numerous opportunities to substantially improve energy efficiency in India that are worthwhile from both the economic and environmental perspectives. India’s National Mission on Enhanced Energy Efficiency (NMEEE) is one of the eight national missions set out in the country’s 2008 National Action Plan for Climate Change. The mission, which is operationalised through the Bureau of Energy Efficiency, has four thrust areas: the Perform, Achieve and Trade (PAT) scheme for trading energy efficiency savings among the country’s largest energy consuming plants; the Market Transformation for Energy Efficiency (MTEE), which focuses on energy efficiency programmes and building codes; the Energy Efficiency Financing Program; and the Framework for Energy Efficient Economic Development. This section discusses several directions in which the country’s mission to enhance energy efficiency can be intensified and broadened in scope, including reform of fuel subsidies, electricity sector reform, and more vigorous use of energy efficiency standards. This section discusses India’s fuel subsidies while electricity subsidies in agriculture are discussed in the next section and Section 4 below. The system of fuel subsidies in India has been implemented through centrally administered selling prices that can be charged by downstream oil marketing companies (OMCs) for diesel, kerosene and LPG. (Petrol subsidies were eliminated in 2010.) Losses to the companies are covered through a per unit subsidy (for kerosene and LPG), ad hoc subsidies from the government budget to cover “under-recoveries”, and through borrowing by the OMCs. The size of fuel subsidies has fluctuated significantly from year to year, in particular as a result of fluctuations in international fuel prices and the price of fuel imports. Fuel subsidies are estimated to have averaged 1.4% of GDP since 2007/08 and are estimated at about that level in 2012/13. Fuel subsidies alone represented some 13.7% of India’s budget expenditure in 2012/13.41 The level of subsidies fell sharply in 2014/15 as a result of the steep fall in world oil prices in the second half of the calendar year 2014. In the absence of reforms, however, subsidies could also swing higher in future in the event of an upswing in international prices. International oil prices are inherently volatile. Countries with significant fuel subsidies are therefore exposed to large swings in the fiscal position of the government. With growing awareness of their economic and environmental costs, the government has moved to scale back fuel subsidies in recent years using a number of fuel-specific measures. As noted, petrol prices were liberalised in 2010. Diesel prices were increased by Rs3.50 a litre in September 2012 and then periodically increased in small amounts from January 2013 onwards. Subsidies for bulk consumers were also eliminated. With falling international oil prices, under-recoveries on diesel switched to a small over-recovery by late in the calendar year 2014, allowing the government to remove diesel price controls altogether in October 2014. Per unit subsidies for LPG and kerosene have generally been higher than for other fuels because of their greater sensitivity for the poor. While paying a per unit subsidy on LPG and also controlling the selling price, the government has aimed to limit the total fiscal impact by restricting the number of cylinders of LPG that households can buy at the subsidised price. The government announced in October 2014 that LPG selling prices would vary with international prices from 2014/15 onwards. The government has also followed a policy of gradually reducing the supply of kerosene through the public distribution system. The present interlude of low world oil prices provides an excellent opportunity to accelerate the removal of remaining fuel subsidies in a carefully sequenced, equitable and sustainable manner. Reform of kerosene and LPG subsidies would need to be handled would have the greatest impact on lower-income groups and would need to be combined with social protection measures to offset the impact on the poor and most vulnerable. The possibility of transforming various in-kind subsidies into cash transfers is being actively studied in India. Elimination of fuel subsidies could then be undertaken alongside a broader modernisation of India’s social protection framework, putting in place the institutions and information systems for a modern system of cash transfers that would help to alleviate the impacts of future volatility in world energy prices, among other risks facing the poor. India’s electricity sector is rife with inefficiencies and supply bottlenecks that result in huge unmet demand, hamper economic growth, restrict access by the poor, stimulate inefficient energy consumption and worsen both local air pollution and carbon emissions. As a matter of policy, state electricity boards have long provided electricity to agricultural consumers at extremely low subsidised prices. In 2013/14 these were estimated at only about 40% of the prices paid by industrial and commercial users.44 Section 4 below notes how such electrical power subsidies do little to increase agricultural productivity, while they encourage excessive use of well pumps and groundwater consumption, as well as stimulating CO2 and methane emissions through various channels. Electricity distribution companies have little freedom to adjust prices flexibly according to market conditions, for example during peak demand periods. Increasingly, average billed tariffs have failed to keep up with costs. Engineering-economic estimates suggest that the adoption of existing cost-effective energy-efficient appliance technologies could result in large reductions in India’s energy consumption and GHG emissions. One estimate is that the adoption of energy-efficient technologies for just three appliance groups – air conditioning, standby power and refrigerators – would reduce India’s power consumption in 2030 by 95 TWh, and GHG emissions by 100 Mt CO2e per year.52 These estimates are conservative in the sense that they assume efficiency levels already envisaged in the current efficiency ratings of India’s Bureau of Energy Efficiency (BEE) and exclude existing so-called super-high efficiency options. There is often a large gap between the availability of appliances that are cost-effective and energy efficient and their widespread adoption by consumers – the so-called “energy efficiency gap”, which has been widely discussed in the research literature. There are nevertheless a range of policy instruments that can be used to encourage more rapid diffusion of energy-efficient appliances in India. Mandatory minimum energy efficiency standards may be an especially effective tool in the Indian context of a boom in purchases by first-time buyers. Engineering evidence suggests that minimum standards could be increased without significant increases in manufacturing costs. The risk of cost increases could be mitigated by linking minimum performance standards to the level of the most efficient models that are already commercially available, as in Japan’s “Top Runner” efficiency program me.54 Nevertheless, there remain valid concerns that standards could result in higher prices that put appliances out of reach of poor first-time buyers. Minimum standards can be complemented with financial incentives to encourage energy demand management and appliance efficiency, for example through consumer rebates. Transport sector energy standards: The transport sector’s demand for energy is among the fastest-growing sources of energy demand in India but has not received much attention in the country’s efforts to improve energy efficiency. Energy demand in the transport sector can be viewed as the product of three factors: total transport activity (measured in, say, passenger-kms), the shares of various transport modes (e.g. public transportation, cars, trucks etc. ), and the energy used per passenger-km for each transport mode. The first two of these relate closely to the structure of cities and are considered further in the discussion about cities in Section 5. Reform of fuel subsidies will clearly be important to encourage more efficient energy use in transport. Fuel efficiency standards for new cars have been proposed by the Bureau of Energy Efficiency but no action has so far been taken. The prompt introduction of such standards would be an important step towards better management of energy demand in the transport sector, subject to the concerns about higher vehicle prices, as already noted for appliances. In an industrial setting the country’s nascent energy efficiency certificate trading system (Perform, Achieve, Trade) has shown potential. Expansion of the scheme from the very largest industrial units to medium- and smaller-sized firms may prove challenging because of the less standardised outputs of smaller units, requiring a broader menu of potential policy options. India has seen a transformation in the composition of its energy supply in the decades since Independence – away from the previous overwhelming reliance on traditional biofuels consumed in villages by a rural population, towards modern energy sources, primarily fossil fuels, which now comprise almost 75% of total primary energy, with coal alone comprising 45% of primary energy (see Figures 3.5a and 3.5b). Table 3.1 provides further detail on the composition of primary energy in India in 2012 and its change since 1990. The aggregate share of modern non-fossil fuel power sources, such as nuclear, hydro, wind and solar, increased only modestly from 2.5% to 2.9% over the period from 1990 to 2012. 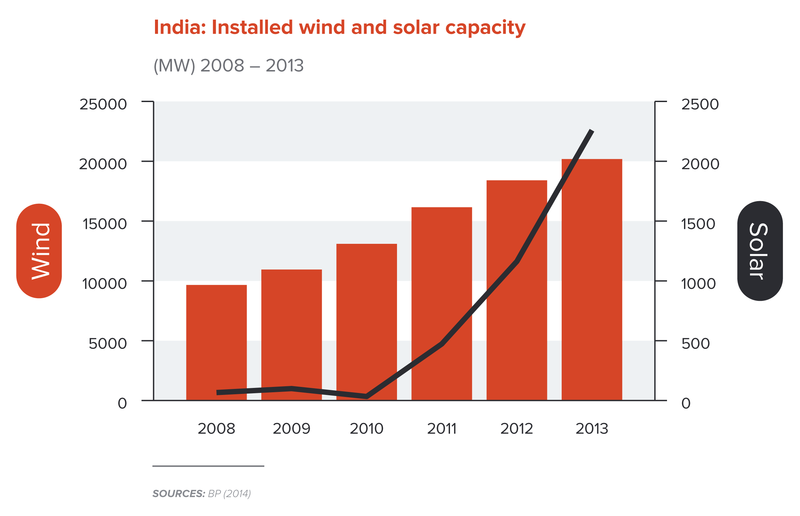 Fast growth in renewables such as solar and wind was offset by only slow growth in hydropower. 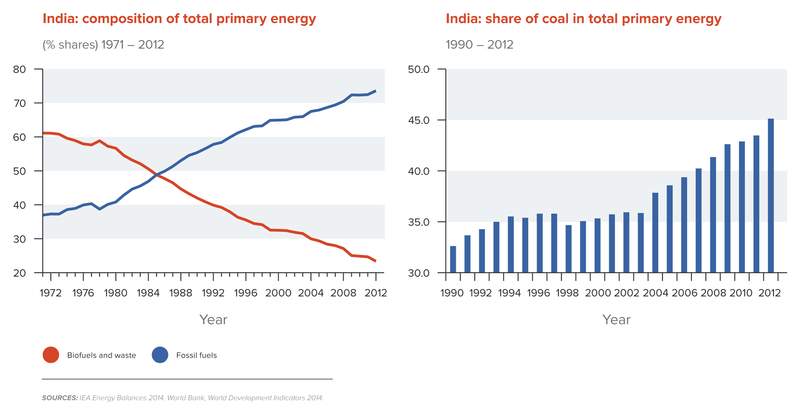 The long-term change in India’s energy mix conforms to a broad “energy transition” that has historically tended to occur as countries move from very low per capita income levels into the middle-income range, accompanied by a rise in the carbon intensity of energy and in carbon emissions themselves.55 Carbon emissions per unit of energy consumed tend to be low in poor, largely agricultural economies because people rely primarily on burning wood, wood waste and other biomass fuels for energy. The burning of biomass only releases CO2 accumulated by plants during their lifecycle and therefore does not add to atmospheric concentrations of CO2. Protocols and guidelines by the IPCC and other standard-setting bodies therefore treat biomass fuels as neutral with respect to CO2 emissions. With rising per capita incomes and industrialisation, the economy becomes more dependent on modern forms of energy, in particular fossil fuels, which have historically provided greater energy density, constancy of flow, flexibility, transportability and ease of control than traditional combustible biomass. IEA, 2014a; World Bank, 2014a. This is a far from uniform process, however. 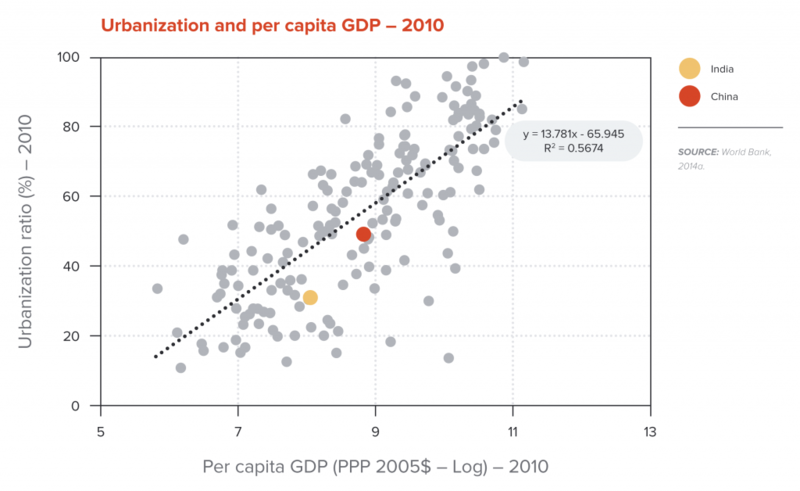 Carbon intensities of energy vary widely at similar levels of per capita income. They are high in China and India, for example, because of the exceptionally high proportion of coal in these countries’ energy mixes. To the extent that the transition to modern energy can be supplied with modern non-CO2 emitting fuels – hydro, geo-thermal, nuclear, solar, wind etc. – the rise in CO2 intensity can be moderated. Brazil, an upper-middle-income country, has a CO2 to energy intensity ratio much lower than other countries at its level of development because of plentiful hydropower. In addition there is some tendency for carbon intensity to fall at higher income levels, as countries shift away from coal and adopt policies to reduce local air pollution from burning fossil fuels, as well as to reduce CO2 emissions for climate mitigation reasons, opening the door to greater use of modern clean technologies. 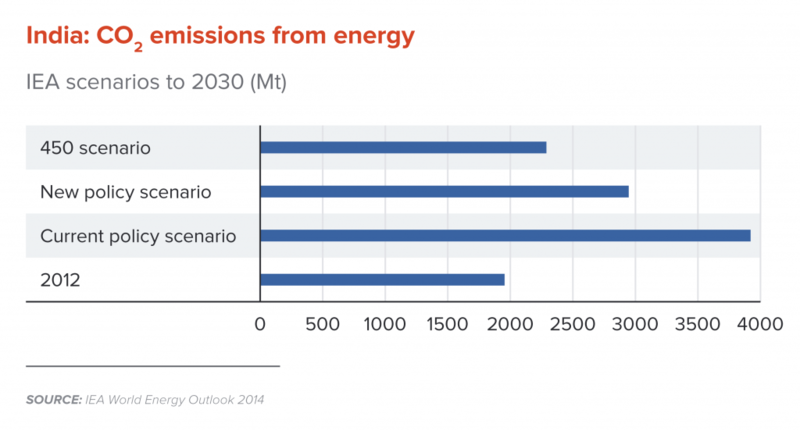 Source: IEA, 2014b, World Energy Outlook 2014, for energy and CO2 emission data. Authors’ calculations for other Memo Items. (1) Million tonnes of oil equivalent. (2) Total primary energy demand. (3) % compound annual average growth rate. (4) Total non-fossil fuel energy excluding bioenergy. (5) Energy to GDP intensity –kg of oil equivalent per US$1000 GDP (2005 constant PPP). (6) CO2 to energy intensity – kg per kg of oil equivalent energy use. India’s carbon intensity of energy has been rising for decades as the country has increased fossil fuel consumption relative to traditional biofuels, in particular with rising use of coal for electricity generation, and diesel and gasoline for transport. This shift is an important contributor to the rapid growth in India’s CO2 emissions, as well as to urban outdoor air pollution. Figure 3.6 shows that CO2 emissions from energy were rising at an average 5.6% a year in both the 1990s and 2000–13, among the fastest internationally. We can make a simple breakdown of CO2 emission growth as the sum of growth in total energy consumption and growth in the CO2 intensity of energy (units of CO2 emissions per unit of energy consumed). Figure 3.6 shows that fast growth in overall energy consumption – discussed in Section 3.1 above – was clearly a major driver of emission growth. But rising CO2 intensity of energy was also an important contributor. Around the world the median rate of change in CO2 to energy intensity was approximately zero in the 2000s. In other words half of all countries experienced a falling CO2 to energy intensity in this period and half a rising CO2 to energy intensity. 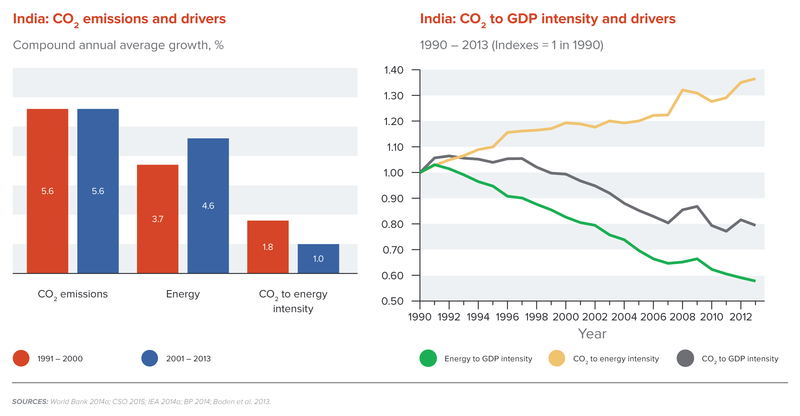 India was among the latter group, with an increasingly CO2-rich fuel mix. Where does all this leave India? It seems fair to say that the performance of the energy sector has been unsatisfactory and leaves India exposed to significant vulnerabilities. Despite the ramp-up in coal-fired power generation capacity since the mid-2000s, power supply remains subject to serious shortages and blackouts. In addition to the severe inefficiencies in power distribution discussed earlier, it has proven difficult to increase domestic coal production because of numerous institutional and technical difficulties. This has led to a surge in expensive foreign currency denominated net coal imports, which rose more than sixfold from 13.9 mtoe in 2000 to 88.5 mtoe in 2012, contributing to sharply increased energy insecurity. Some Indian private sector power generators are attempting to develop vertically integrated coal mining operations in Australia as a source of supply, but it has been estimated that the cost of such supplies will be much higher than the rates negotiated with the government under long-term power purchase agreements (PPAs), and could be as much as 30–50% higher than the cost of wind and solar power by 2030, especially given the rapid ongoing fall in the cost of renewables. (See discussion of renewables below). Faced with the dilemma of running coal-fired power plants at well below optimal utilisation rates or importing expensive foreign coal, numbers of private firms in the generation sector are reporting financial losses.59 Even with proposed improvements in the efficiency of Indian domestic coal, the marginal unit of supply is likely to remain imported coal. In this context, the substitution of financially competitive renewable energy for imported coal at the margin will have important economic and social benefits for India, such as greater energy security and a cleaner environment. From the perspective of maximising India’s own social efficiency and social welfare it is important that all the social costs and benefits of different fuels be taken into account in determining the optimal energy mix for the country. Given the size of the local harms associated with coal and other fossil fuels there is little doubt that India could improve its welfare by putting a much greater emphasis on improving energy efficiency and on developing modern non-fossil fuel power sources, such as nuclear, hydro, wind and solar. To reiterate, such a course is desirable purely from the viewpoint of India’s own welfare. Global benefits in terms of reduced climate risk would be additional co-benefits to these Indian national benefits. The most efficient instruments to achieve a more socially optimal fuel mix are fuel taxes that reflect the pollution and harms caused by each fuel type. In addition to reducing local damages, such taxes would also raise significant government revenues, providing resources to reduce other more distorting taxes, to increase productive development spending or to fund cash transfers to compensate poor fuel consumers. The IMF calculates that optimal fuel taxes for coal, diesel, gasoline and natural gas would generate government fiscal revenues worth 6–7% of GDP in India.61 As noted, the government has significantly increased excise taxes on petrol and diesel since October 2014. It also increased the cess on coal but recognizes that “there is still a long way to go with potential large gains still to be reaped from reform of coal pricing”.62 The use of fuel taxes to promote a more efficient fuel mix can be complemented with other instruments, such as regulation, concessional development financing and public investment policies to encourage alternative clean energy sources, as discussed below. It is sometimes argued that such a course, which takes into account environmental and other externalities, is simply too costly for a developing country in terms of their overriding objective of economic growth. Note, however, that a lack of environmental regulation in a country is implicitly a way of discriminating against some sections of the country’s own population in favour of others. It is in effect a form of subsidy to highly polluting firms at the expense of a less healthy public, and less polluting firms. In addition, the exclusive use of GDP as a yardstick to measure the welfare effects of reform can be misleading. The effect on GDP might include a potential loss in measured output of goods and services, but not other types of changes in welfare, for example in improved health. Policy-makers should supplement GDP effects with estimates of broader welfare gains, which can also be estimated in monetary terms, albeit sometimes only approximately. Wind and solar generating capacity is still small but rising fast. Wind capacity doubled to 20 GW between 2009 and 2013, while solar, although much smaller, is rising much faster, increasing by almost five times in just two years, to reach 2.3 GW in 2013 (see Figure 3.8). The newly elected government has signalled a strong commitment to rapidly expanding clean energy sources. Previous National Solar Mission targets of reaching 20 GW by 2022 have been increased to 100 GW in the same timeframe.65 The physical potential for renewables generation in India is very large. A recent estimate by the Ministry of New and Renewable Energy puts India’s potential solar capacity at 749 GW.66 Estimates of total wind power capacity by Lawrence Berkeley National Laboratory have estimated India’s total wind energy capacity at 2,000 GW or even higher. As large as India’s renewables capacity may be, many difficult policy and institutional reforms will be needed to make the rapid expansion of renewable power a reality. Renewables expansion is hampered by the high cost of capital and problems of land acquisition in the country. India’s unreliable and inefficient transmission network will need to be upgraded and expanded to allow tapping of power from new wind and solar sites. The high cost of financing is likely to be the single most important impediment to expanding renewable energy in India, and one where carefully designed reforms could have an important impact on accelerating investment in this sector. Renewable energy projects are especially sensitive to financing costs because 85–95% of the total discounted lifetime cost of these projects are upfront capital costs, compared with only one-third for gas projects, for example. At the same time, debt costs in fast-growing developing countries like India tend to be much higher than in developed countries, due to strong competing demand for investible funds, higher risks, higher inflation and immature financial markets. While renewable energy projects in the US or Europe can typically borrow at 5-7%, fixed for a 10–15-year term, a similar project in India could see borrowing, if it were available, charged at up to 12-14%, raising project costs by as much as a third. It is important to recall that, even with strong reforms, national energy systems contain a high degree of inertia and take a long time to restructure from one energy paradigm to another. Nevertheless, the pace at which the transition to energy efficiency and non-fossil fuel power sources takes hold will make a huge difference in the levels of CO2 and local air pollution, the health of the public, and the nation’s energy security. Long-range scenarios of energy demand and supply are affected by tremendous uncertainties about future technologies, economic and social context and policies, among other factors, all of which often contribute to significant differences in scenarios from various authoritative sources. With these caveats, it is useful to consider energy scenarios for India in 2030 prepared by the International Energy Agency (IEA) in its World Energy Outlook 2014 (see Figures 3.9a and 3.9b).70 The “Current Policies Scenario” is a business-as-usual scenario, which assumes only those policies and implementing measures that had been formally adopted as of mid-2014. In this scenario fossil fuels, coal consumption and CO2 emissions all double between 2012 and 2030, with CO2 emissions reaching almost 4 billion tonnes. The “New Policies Scenario” assumes that relevant policy proposals that had not been adopted by mid-2014 are also implemented, while the “450 Scenario” assumes a much stronger set of measures adopted as part of a global initiative to limit the increase in global temperatures to 2°C. These scenarios assume increasingly rapid gains in energy efficiency and an increasingly large rise in the share of low-carbon fuels such as wind, solar, and nuclear. 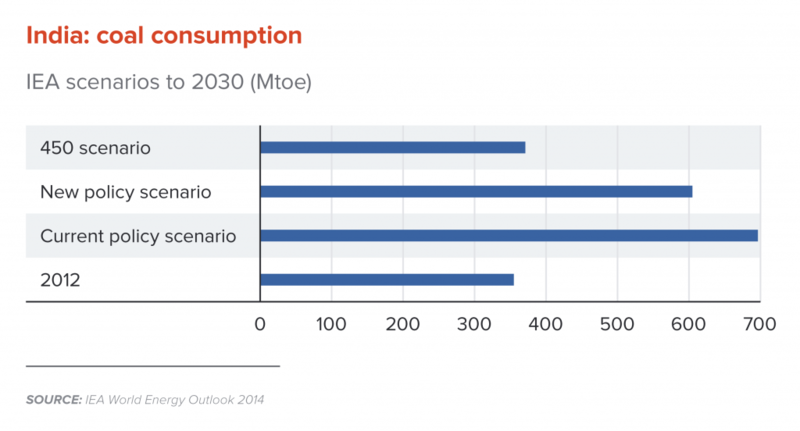 In the “450 Scenario”, coal consumption is not much higher in 2030 than in 2012, and is much lower than in the “Current Policies Scenario”, showing the potential for outcomes where powerful development gains are combined with much better environmental outcomes. All three IEA scenarios assume 6.4% annual GDP growth, the same as the historical trend in the period 1990–2012, but lower than official goals of 8–9% growth. Faster growth without strong policy measures to increase energy efficiency and clean energy sources would result in even more dramatic increases in coal use, energy insecurity and pollution. These comments underline the urgency for India to build strong low-carbon initiatives integrally into its growth agenda. In this section we demonstrate that Indian agriculture exhibits broad opportunities for reforms that can achieve “triple wins”. Agriculture remains an important sector of the Indian economy. 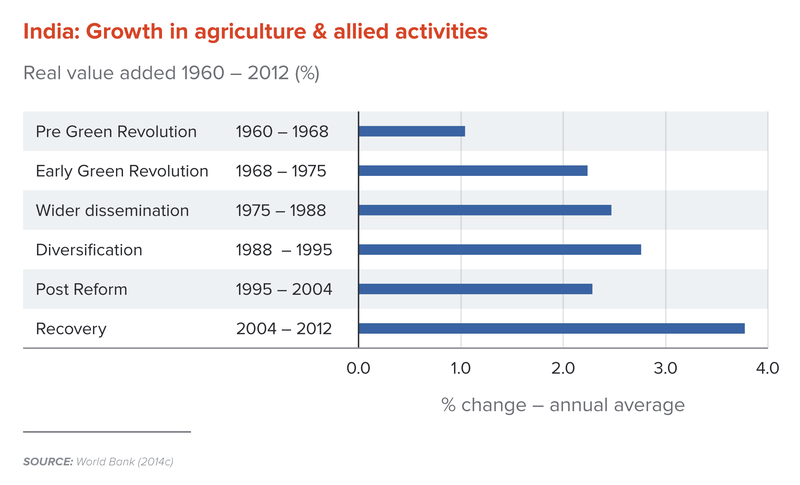 While the share of agriculture and allied activities in GDP has fallen slowly, from over 40% in the 1960s to about 17% today, almost half of all employment is still in this sector, and over two-thirds of the population still live in rural areas (see Figure 4.1). (By way of contrast, in a recently developed Asian economy, Korea, the share of agriculture in GDP and in employment, is 3% and 7% respectively). From a heavy dependence on foreign food aid in the early decades after independence, agricultural development has advanced sufficiently for India to become first self-sufficient and then a net exporter of food. Output of food grains has reached around 260 MT, together with large volumes of other diversified agricultural crops. Despite these advances, agriculture faces numerous challenges, many of which are only likely to become more pressing with time. Notwithstanding rising food production, malnutrition in the country remains relatively high, as noted in the earlier discussion of human development. Demand for food is likely to both grow more rapidly and become more diverse with rising living standards, urbanisation and population growth, placing more pressure on agricultural supply capacity. While poverty has fallen rapidly over the past decade, over 200 million people remain below the national poverty line in rural areas, while large additional numbers subsist near it. Sustained rapid growth in agriculture will be needed to provide a continued increase in opportunities and living standards for the large numbers of rural poor and near poor. Yet, as discussed below, agricultural productivity growth has generally been modest and the sector remains hampered by weak technical capacity, numerous sources of inefficiency and growing pressure on environmental sustainability, in particular the water and land resources on which the sector depends. Agriculture in India is still highly dependent on rainfall. As a result, production remains highly sensitive to weather shocks and existing climatic variability, a problem that will get worse as the effects of human-induced climate change are felt over the coming decades. (The potential impacts of climate change on India, primarily through agriculture, were noted in Section 2 above.) At the same time, a range of public subsidies and other policy distortions encourage excessive extraction and wasteful use of groundwater, contributing to declines in water table levels. Agriculture accounts for 90% of annual freshwater withdrawals, a proportion that is unusually high by international standards and that has hardly fallen over recent decades, despite the gradual decline in the relative importance of agriculture in the economy. Overall freshwater withdrawals now absorb over 50% of internal renewable water resources (defined as internal river flows and groundwater from rainfall), a proportion that has risen from about one-quarter in the late 1970s. Output (real value added) in agriculture and allied activities in India rose by an average 2.7% a year in 1960–2012, which was modest compared with, say, 4.3% a year in China and 3.4% a year in Brazil and Indonesia over the same period. Agricultural growth does nevertheless appear to have strengthened over time. Application of the “Green Revolution” package of high yielding seeds, irrigation, fertilisers and pesticides, together with diversification in crops, helped boost trend growth from only around 1% a year in much of the 1960s to 2.8% a year in the period 1988–95. After a slowing in the mid-1990s and early 2000s, growth rebounded to a relatively strong 3.8% trend rate in 2004–2012 (see Figure 4.2). Welcome as the rebound in agricultural growth since the mid-2000s is, a closer look at recent performance indicates a number of reasons for caution in drawing prematurely or excessively optimistic conclusions. Agriculture is a major contributor to India’s GHG emissions. Direct emissions from agriculture are estimated at 334.4 Mt CO2 equivalent in 2007, comprising 17.6% of India’s total emissions.79 Of these, by far the largest are emissions from the livestock sector, mostly methane from the digestion process in animals (see Table 4.2). Other major sources are methane emissions from rice cultivation and nitrous oxide emissions from various methods of soil management, for example application of fertilisers. The preceding brief review suggests that, while there has been substantial progress in improving the productive capacity of Indian agriculture over the decades since Independence, the rate of improvement has been relatively modest by international standards. There has been some acceleration in growth of the overall agricultural sector since the mid-2000s but, among other reasons for caution, productivity performance for traditional crops is lagging. Agriculture remains vulnerable to existing climatic variability and future climate change, while also driving rapid growth in groundwater extraction, something that threatens the long-term economic sustainability of the sector. Through direct and indirect channels agriculture also generates about 30% of India’s GHG emissions. We comment first on the broad framework of public expenditure in agriculture, the distorted incentives created in this framework and the potential for efficiency-enhancing expenditure reforms. We then briefly review other specific reforms. These results suggest that there is considerable scope to improve the economic effectiveness of public spending on agriculture by reallocating spending away from low-yielding subsidies (currently the largest item of spending) towards high-yielding agricultural R&D (currently one of the smallest) and other spending on education, extension services and rural infrastructure. Other subsidies, such as credit subsidies, also interact with power subsidies to further encourage tube well deployment and groundwater depletion. High fertiliser subsidies on domestically produced urea relative to other nutrients cause unbalanced fertiliser use, which, beyond certain thresholds, results in lower land and labour productivity. Fertiliser use is also a source of nitrous oxide emissions, a GHG. The political economy of subsidy reform is not easy. Nevertheless, the evidence in this section suggests that a reorientation of public spending away from subsidies towards productive spending on R&D, education and infrastructure would have substantial benefits for agricultural productivity and rural production. Such a reorientation would also greatly strengthen resilience to climate change by encouraging much greater care and economy in the use of a scarce resource, water, as well as help to abate GHG emissions linked to agriculture through various channels. India has one of the largest livestock herds in the world. Productivity is generally low, however. Average milk yields are about one-half of the world average, for example. Due in part to religious sensitivities about slaughter of cattle, the number of unproductive animals (in particular males) is high and growing. As noted above, methane emissions from livestock are the largest source of agricultural GHGs in India, an outcome made worse by the high cellulose content of crop residues, the animal’s chief diet. The large number of animals also reduces resilience by adding to demands on the country’s scarce water resources. Public spending in support of the livestock sector is low and declining. While there are numerous opportunities for mitigation in agriculture, the potential for sequestration of CO2 in forestry is likely to be much larger. Already announced objectives under the “Green India Mission” look to expand forest cover and improve the quality of cover over some 10 million hectares over the next 10 years, which would have an annual mitigation potential of 55 Mt CO2 equivalent. The announced measures represent only a small fraction of what could be undertaken over the longer term. For example, current programmes to improve canopy density in moderately dense forests cover only 1.5 million hectares out of a total 32 million hectares of such forests. Forestry initiatives would also strengthen resilience by increasing infiltration, groundwater recharge and stream flows, and also expand economic opportunities for 275 million people who constitute forest communities. Rice cultivation: As noted, a decrease in power and other subsidies would reduce uneconomic incentives for crops like rice, which is both water intensive and a source of methane. There is, in addition, much scope for expanded use of new methods of cultivation, such as the System of Rice Intensification (SRI), which sharply reduces water usage, thereby lessening methane emissions and improving resilience, while also boosting output. Water management: The potential for subsidy reform to greatly increase efficiency in use of water has already been noted. In addition, there are technological improvements that need to be much more extensively promoted. These include more energy-efficient water pumps and micro-irrigation methods such as drip and sprinkler irrigation. Unfortunately, there are few automatic guarantees that urban development will necessarily evolve in ways that maximise agglomeration economies and productivity while curbing GHG emissions, local air pollution and congestion. The dominant growth pattern in many urban areas – including many Indian cities – is characterised by unmanaged sprawl and increasing car use.96 The fact that individuals and firms often do not take into account the full economic and social benefits of more compact, vibrant and connected urban centres creates a bias towards more urban sprawl. Other market failures also contribute, such as the lack of pricing for externalities such as air pollution, congestion or road traffic accidents (a major source of death and injury, particularly in developing countries). Lack of city-level institutional and planning capacity tends to work in the same direction. Policy failures include building regulations, infrastructure financing models or urban tax codes that implicitly subsidise sprawl. Once a city starts to sprawl, it creates its own logic for further sprawl, by shaping household expectations about dwelling space and commute time; and building up a political economy of property developers and transport providers. Alongside climate change, urban sprawl is one of the most significant examples of a market failure worldwide. The rapid, often chaotic pattern of periurban development in India differs in some respects from some common definitions of urban sprawl, which refer to a process in which a city with low population density spreads over a large and growing area. Indian cities, by contrast, have high population density. By one estimate Mumbai and Kolkata are the first and second most densely populated large cities in the world, with Chennai the eighth. The Indian model of increased urban sprawl and conventional motorisation also contribute to increased energy consumption, urban air pollution and GHG emissions. The large impacts of air pollution on health in India were discussed in Section 2 above. 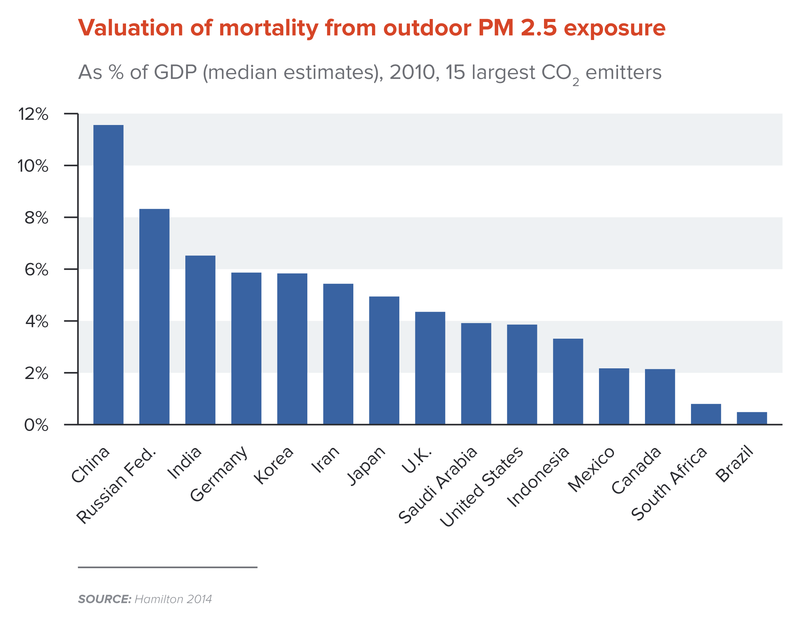 As noted, India is in the upper quintile of countries for deaths per 100,000 from ambient particulate matter pollution. 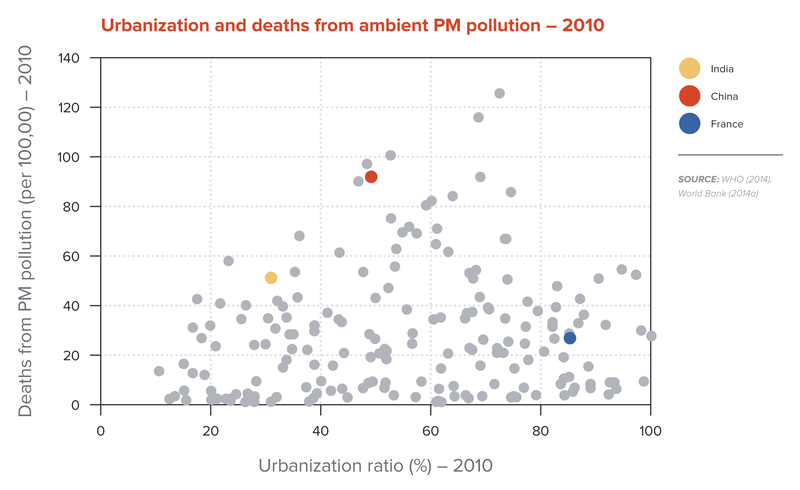 Figure 5.2 suggests that there is no cross-country correlation between urbanisation and deaths per 100,000 from ambient particulate matter (PM) pollution. The figure is consistent with the idea that it is not urbanisation as such that is associated with health damages from pollution, but rather it is the form of urbanisation, together with policies and other factors, that has more influence on deaths from PM pollution. As argued in Section 2, a continuation of India’s current model of rapid urbanisation with high levels of PM2.5 concentrations would risk a severe increase in the rate of premature deaths attributed to ambient PM pollution. Indian cities struggle with severe infrastructure deficits, which generally worsen down the social gradient, from rich to poor, and down the spatial gradient, from core metropolitan areas to smaller and more distant cities and peripheral areas. Sewerage and sanitation are another pressing concern in Indian cities. In 2011 only 81% of urban households had a toilet facility within their premises, and only a third of urban household toilets were connected to sewerage systems, with the remainder disposing of untreated sewage into the ground or into surface water. Overall, only about 14% of sewage from Indian cities was treated. Over 50 million urban dwellers defecate in the open. A 2008 study by the Ministry of Urban Development found that 190 out of 423 cities were in a state of emergency regarding sanitation and public health, while none could be classed as healthy or clean. Access to electricity is far better in cities than in rural areas, with about 90% of urban households using electricity for lighting. As noted in Section 3 on the energy sector, however, it is the low quality of electricity access and frequent power outages that are a serious concern for many urban households. Weak public transportation options in most Indian cities have encouraged rapid growth in private motor vehicle ownership, which has aggravated the social costs of urban sprawl, for example congestion, longer travel times, local air pollution and GHG emissions. The number of vehicles rose at 5–9 times the rate of growth in the urban population between 1980 and 2011, with the fastest growth in two-wheelers. Vehicle ownership is, however, lower in metropolitan areas with relatively well-developed public transport systems, such as Kolkata and Mumbai (respectively, 44 and 102 vehicles per 1,000 people), than in cities like Delhi with a less well-developed transport network (493 per 1,000). Fast-growing smaller industrial cities with even less well-developed public transportation systems, such as Ludhiana and Coimbatore, exhibit vehicle ownership rates much higher even than Delhi. As we discuss further in Section 5.2 below, to be effective such an infrastructure push needs to combined with broad reforms of land regulations (in particular), as well as of urban government institutions that would implement and manage infrastructure. It is important to stress that not only does good infrastructure promote more compact cities, but more compact cities also reduce the cost of infrastructure and improve its productivity. The need to build certain kinds of infrastructure, such as motorways, is reduced or eliminated altogether, the fixed costs of building water, sewerage and other systems in outlying areas are reduced, and existing or new infrastructure in city cores can be used more intensively, reducing average costs. One analysis suggests that urban sprawl generates external costs of US$400 billion annually in the United States.109 Combined with complementary reform policies, infrastructure investment can play a central role in developing Indian cities that are not only more productive but also far more energy efficient, clean and enjoyable to live in. The dysfunctional patterns of urbanisation in India noted in the previous section arise from a number of long-standing, deeply ingrown and mutually interlocking policy distortions and institutional weaknesses. Highly restrictive land regulations cause intense pressures for urban sprawl. Yet proposals to build more compact cities are countered by the undoubted fact that greater densities in urban cores would overwhelm the rickety and inadequate existing infrastructure of these areas. Efforts to strengthen urban infrastructure and planning are in turn stymied by the weaknesses of urban governance and institutions. This creates a difficult challenge for reformers, who will need to proceed simultaneously on many interlinked fronts. Other regulations, such as maximum building heights, set back requirements and plot-coverage ratios also sharply limit the intensity with which households and businesses are able to make use of available land. Rent control laws and the lack of a well-developed housing finance system also constrain the supply of new housing stock. Efficient functioning of land markets is hampered by weak systems for appraising land values, determining property rights and conducting public land acquisitions. The need for reform of land regulations to promote more compact cities and productive urbanisation has increasingly become a part of the India policy debate. It is nevertheless often argued with considerable plausibility that reforms of land regulations on their own will fail to achieve improved productivity and greener development because the increased urban population densities they are designed to achieve would overwhelm the already rickety urban infrastructure of Indian cities (discussed earlier in Section 5.1). This problem points to the need for careful coordination of land regulation reforms with development of infrastructure services. On the one hand local governments have found it difficult to mobilise their own taxes and user fees, while on the other hand, intergovernmental transfers to local governments from the states and centre have also been inadequate to their needs. The own revenues of India’s local governments were only 0.5% of GDP in 2007/08 (compared with 2–3% in Brazil), while intergovernmental transfers were only 0.4% of GDP. Property taxes are the primary own revenue source available to local governments but have suffered from poor collections and lack of buoyancy, due to a lack of systems to appraise current land values, outmoded tax assessment methods based on rental value rather than area, and widespread tax evasion, among other factors. The fact that reforms can bring major returns was shown in Bangalore, however, where reform of the property tax led to a near 80% surge in revenues between 2007/08 and 2008/09. Property tax reforms that focus on taxing land values rather than building space can be particularly effective in promoting compact development. As regards intergovernmental transfers, the Constitution requires states to establish State Finance Commissions to determine the allocation of state revenues to local governments but often these Finance Commissions have not been established or their recommendations have simply not been implemented. Intergovernmental transfers to local governments have remained opaque, ad hoc and inadequate. Cities with a more secure revenue base – either from own revenues or transfers – are likely to secure better credit ratings and greater access to private capital for urban infrastructure investment. This can create a virtuous circle, with more vibrant urban growth generating more revenues. Second, apart from the financing of local government expenditure, the allocation of responsibilities between various levels of government itself often remains unclear and confused, hampering effectiveness in urban service delivery. Being at the discretion of the states, there is considerable variation in the extent to which functions have actually been devolved to local government. Low administrative capacity in local governments provides states with a convenient reason to limit devolution. Third, there is little effort to foster accountability of local government officials to area residents. Elected local officials often have little control over key decisions such as staffing, which remains in the hands of the state governments. Institutions to elicit participation by local residents remain underdeveloped. The government’s intention to massively expand urban investment on “smart cities” provides a tremendous opportunity to simultaneously tackle the key interlinked issues affecting India’s urban development. Valuable lessons can be drawn from the experience of the Jawaharlal Nehru National Urban Renewal Mission (JnNURM). The latter represents a major effort by central government to significantly increase the volume of resources for urban infrastructure development, while also encouraging policy and institutional reforms to improve the effectiveness with which such resources are used at both the state and urban local-government level. JnNURM has aimed to foster such municipal reforms as strengthening local government accounting systems, improving property tax collection through the use of Geographical Information Systems (GIS) and by increasing user charges to cover operating and maintenance expenses. Overall though, states have sometimes been reluctant to undertake the reforms proposed under the programme, while weak execution capacity at the urban local-government level has created a large gap between projects approved and completed. Only 227 out of 650 projects approved in 2006–13 were completed.116 A thorough impact evaluation of the JnNURM can help to lay the basis for a renewed and comprehensive “smart cities” urbanisation strategy encompassing policy reforms of land regulations and markets, strengthening institutions of urban governance and a greatly expanded urban infrastructure development. Rapid GDP growth helped to lift close to 140 million people in India out of poverty between 2004/05 and 2011/12. Growth slid to only about 5% in 2012/13, however, the lowest in the last decade, accompanied by a sharply lower investment growth, due to increased policy and regulatory uncertainty and “execution bottlenecks” in large infrastructure projects, among other factors. The pace of recovery from the slowdown is uneven and uncertain. Restoring rapid growth is crucial to further sustained progress on poverty reduction. India’s new government, which came to power on the promise of better economic management, faces definite challenges in reviving growth – but also significant opportunities to reshape the growth model. 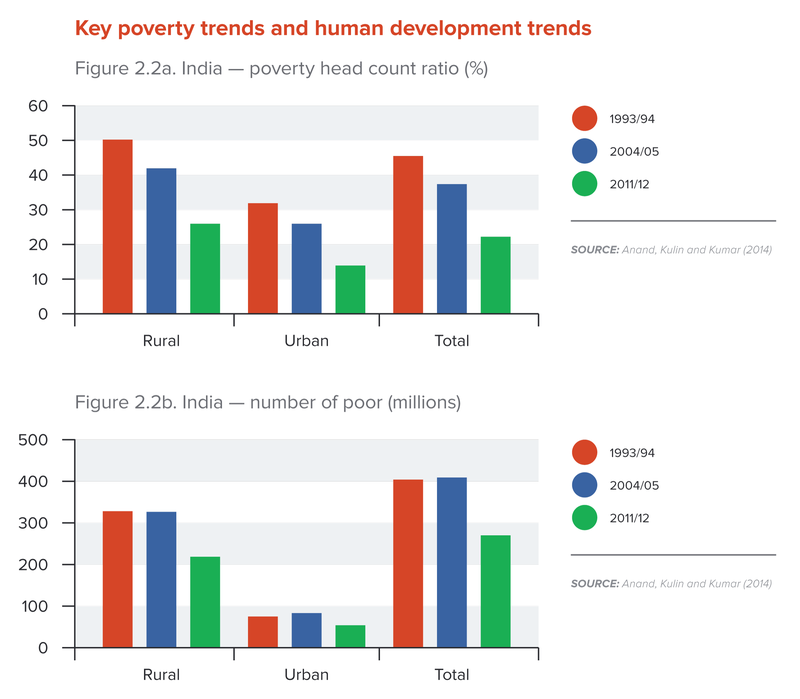 India still accounts for 30% of those living in extreme poverty in the world. With shrinking fiscal space, the government needs to ensure that spending on poverty reduction is better targeted and much more effective than in the past. Until now, besides growth, various food, energy and fertiliser subsidies have been the preferred instruments to address distributive concerns. According to the National Accounts Statistics, these subsidies exceeded 4% of GDP at current prices.117 A familiar criticism of the subsidy regime in India (and indeed elsewhere) has been its poor targeting and the distortions it introduces in the economic system. Fuel subsidies are inefficient for social protection since a large share of the benefits go to higher-income groups. In the rural areas subsidies contribute to excessive consumption of groundwater and fuel with damaging consequences for the environment. Better targeting through direct transfers can address these problems while at the same time enhancing the efficiency of resource use. The new government is grappling with how to go beyond piecemeal reforms to find a template for much bigger, transformative changes. A competitive democracy and a weak state have often been cited as reasons for the lack of deeper structural and fiscal reforms. Within the next year or so there is a golden opportunity for the new government to build consensus for strong structural and fiscal reform to signal intent. Rapid growth is absolutely paramount for India. But the choice of the path for growth will also be fundamental, determining the structural transformations that accompany growth, as well as its inclusiveness and environmental sustainability in the long run. By 2031, when India’s urban population is expected to exceed 600 million, 75% of India’s GDP and 70% of all net new jobs are expected to come from its cities. Land use and energy demand due to extensive urbanisation will require better planning since public policies associated with urban structure matter. How cities develop over the next few decades will be determined by policy choices that are made today. Apart from less congestion and pollution, more compact urban forms are known to upgrade growth and economic efficiency by reducing the costs of infrastructure and improving agglomeration productivity. India’s latest national plan aims for faster, more inclusive and sustainable growth. Cities and energy systems call for investments in land and other long-lived infrastructure and are largely irreversible. Decisions about these will determine whether India will achieve the aim of faster, inclusive and sustainable growth. The troubles that countries like China have had with severe local air pollution in the recent past ought to counsel caution. China is now taking strong action to clean up its cities. India’s future too lies in compact cities that are less polluted and are not congested, in efficient and robust agricultural practices and in a secure and clean energy system that meets the development needs of the country. By making good choices on energy systems, land use and cities, India can boost development and reduce poverty in a sustainable manner. The following paragraphs draw on the detailed discussion in earlier parts of this report to list 11 important areas for reform. The political economy of such reforms is often difficult but experience from both India and other countries provides considerable hope that meaningful progress is possible. Fuel subsidy reforms: With growing awareness of their economic and environmental costs, the Government of India has moved to reduce or eliminate fuel subsidies in recent years. The steep fall in world oil prices in the second half of 2014 provides an opportunity to accelerate the removal of remaining fuel subsidies and to place the ad hoc reforms of recent years on a permanent basis at a time when the impact on consumers will be limited. A plan to complete the reform of fuel subsidies needs to be carefully sequenced, equitable and sustainable over the long term, for example even in times when world oil prices may be high. Subsidy reforms should be coupled with well-designed and targeted measures to protect the poor and vulnerable from higher fuel prices. Elimination of fuel subsidies can be undertaken in the context of a broad modernisation of India’s social protection framework, putting in place the institutions and information systems (such as the Aadhaar programme) for a modern system of social protection based on cash transfers. Power subsidy and electricity sector reforms: Reforms to address large and widespread inefficiencies in the power sector present a major opportunity to boost India’s economic performance while mitigating local air pollution and CO2 emissions. Numerous technical options are available to tackle high transmission and distribution losses but these may not yield desired results unless they are combined with more important reforms of institutions and governance in the electricity distribution sector. Reforms begun in the Electricity Act (2003) need to be pushed forward to unbundle and corporatise state electricity boards, build independent regulatory bodies at the state and central levels, scale back power subsidies and set realistic prices to create financial viability and develop a performance-oriented culture in the sector. The complex political economy problem of how to insulate distribution companies and regulatory bodies from political interference by state governments is a vital dimension of such reforms. Energy efficiency standards: Engineering-economic estimates suggest that adoption of already available cost-effective technologies could result in significant reductions in India’s energy consumption, local air pollution and GHG emissions. The introduction or tightening up of mandatory minimum energy efficiency standards for appliances, vehicles and buildings can play an important role in securing these reductions, combined according to circumstances with fiscal incentives, voluntary codes and expanded information initiatives. Government administrative capacity may need to be strengthened to ensure robust enforcement of standards, as well as careful monitoring and impact evaluation to ensure that standards do not cause unnecessary cost increases or become obsolete in the face of technological progress. Fuel taxes to promote a more efficient fuel mix: India’s rising reliance on fossil fuels, and coal in particular, has resulted in growing energy insecurity and other severe local externalities, such as the health damages associated with local air pollution, congestion and increased accidents. These costs affect the residents of India but are insufficiently reflected in the price of fuels, causing them to be over-consumed and reducing India’s overall social welfare. These costs are quite separate from and in addition to the global harms associated with climate change. The most efficient instruments to achieve a more socially optimal fuel mix are fuel taxes that reflect the pollution and other harms caused by each fuel type. Such taxes also promote energy efficiency and clean energy innovation, and can raise significant government revenues, providing resources to reduce other more distorting taxes, to increase productive development spending or to fund cash transfers to protect poor fuel consumers. The government has increased excise taxes on petrol and diesel since October 2014, but, as noted in the Economic Survey 2014-15, there are still large efficiency gains to be reaped from significantly higher taxation of coal, the most damaging type of fossil fuel. Policies to reduce the high cost of finance for renewable energy: While coal will remain an inevitably large part of India’s fuel mix, investment in non-fossil fuel power sources, such as solar, wind, nuclear and hydro, needs to be sharply boosted. Government initiatives to reduce the present high cost of finance for renewable projects can have an important impact in stimulating private investment in renewables, for example through increased flows of concessional development financing. Such reforms can more than pay for themselves by significantly reducing the subsidy required per unit of renewable energy produced. The creation of a National Renewable Power Corporation should be considered, to undertake major renewable investments with world-class levels of management and technological dynamism. Restructure public spending on agriculture: Public spending on agriculture in India is heavily tilted towards input subsidies for electricity, fertilisers and irrigation. These do little to raise agricultural productivity while they encourage waste of scarce groundwater, damage resilience and stimulate GHG emissions. A reorientation of public spending away from subsidies towards spending on agricultural R&D, extension services, rural infrastructure and education would have substantial benefits for agricultural productivity while conserving precious groundwater and mitigating GHG emissions. The political economy of agricultural subsidy reform is undoubtedly difficult, but could to some extent be handled if farmers are compensated by credible and tangible improvements in public service delivery and better infrastructure. Although it is wealthier farmers who garner disproportionate benefits from agricultural subsidies, potential adverse impacts of subsidy removal on the rural poor should be addressed through a modern, nationwide system of social protection that needs to be developed not only for this purpose but as a key element in India’s broader agenda for equitable development. Livestock sector reforms: India has one of the largest livestock herds in the world, but one which has low productivity, and also represents the largest source of agricultural GHGs. Stronger public initiatives are needed to improve management of animal reproduction, health and diet, including measures that lead to a smaller but healthier and more productive herd, reducing both pressure on natural resources and agricultural GHG emissions. Forestry initiatives: Existing initiatives to expand the quantity and quality of forest cover under the “Green India Mission” need to be scaled up. The benefits include strengthened resilience by increasing infiltration, groundwater recharge and stream flows, increased economic opportunities for forest communities and increased sequestration of CO2. Reform land regulations: Costly and often chaotic urban development in India is linked to long-standing and mutually interlocking policy distortions and institutional weaknesses, including perverse land regulations, inadequate urban infrastructure and weak systems for urban local government. Reforms to achieve more compact, productive and green cities will need to move in a coordinated way on these key fronts. Highly restrictive floor space indexes (FSI) need to be relaxed in line with standards prevailing in dynamic international cities, to permit much taller buildings and much greater availability of built-up space for given land areas. Reforms of rent control laws, better systems to appraise land values and determine property rights and a more developed housing finance system are also needed. Expand and renew urban infrastructure: Indian cities struggle with severe infrastructure deficits for water supply, sewerage, sanitation, electrical power and urban transportation. Without a coordinated expansion and refurbishment of urban infrastructure, any reforms of land regulations that increase built-up areas and population density would put even more pressure on already rickety and inadequate service delivery systems. The Jawaharlal Nehru National Urban Renewal Mission (JnNURM), launched in 2005, represented a major recognition and effort to move forward urban infrastructure development in coordination with reform of land regulations. A comprehensive impact evaluation of the JnNURM is needed to draw lessons, improve effectiveness and lay the groundwork for a renewed and scaled-up urban investment and reform agenda. Initial reviews of results have highlighted challenges in project selection and implementation capacity at the level of urban local governments. Reform and strengthen urban local government: Urban government in India can best be described as in a state of partial or incomplete decentralisation. While the Constitution defines 18 functions for devolution to local government, in practice, however, the allocation of responsibilities between various levels of government remains muddled. Local governments’ administrative capacity and accountability to residents is limited at best, while their fiscal resources remain far below the levels needed to accomplish their tasks. A much clearer allocation of responsibilities is needed, especially between state and urban local governments, while administrative capacity and accountability at the local level needs to be strengthened. Urban local governments need access to much greater resources to deliver on the tasks with which they have been mandated. Local government own revenues need to be bolstered, including through reform of property taxes in particular. Intergovernmental transfers from the state level and the centre also need to be boosted, together with better monitoring and accountability to ensure enhanced resources are well spent. Lim, S.S. et al., 2012. A comparative risk assessment of burden of disease and injury attributable to 67 risk factors and risk factor clusters in 21 regions, 1990–2010: a systematic analysis for the Global Burden of Disease Study 2010. Lancet, 380. 2224–2260. Hamilton, 2015 (forthcoming). Calculating PM2.5 Damages as % of GDP for Top CO2 Emitters: A Technical Note. Van Benthem, A.A., 2013. Energy Leapfrogging. Wharton School, Univ. of Pennsylvania. Van Benthem, A.A. and Romani, M., 2009. 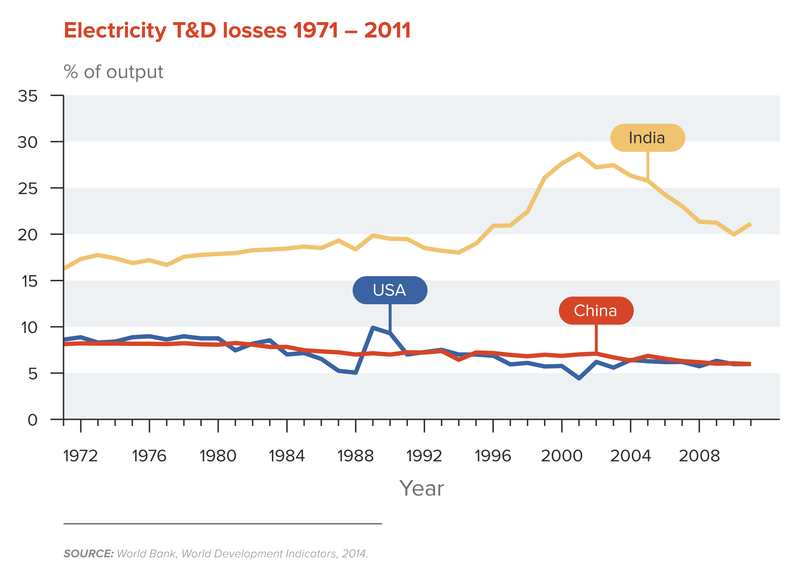 Fuelling Growth: What Drives Energy Demand in Developing Countries? Energy Journal, 30(5). 91–114. See, for example, Arseneau, D., 2011. “Explaining the Energy Consumption Portfolio in a Cross-Section of Countries: Are the BRICs Different?” Federal Reserve International Finance Discussion Papers IFDP 1015. February. INCCA, 2010. Climate Change and India: A 4×4 Assessment: A Sectoral and Regional Analysis for 2030s. Singh, A., 2011. The Changing Landscape of Public Expenditure and Investments in Indian Agriculture. Indian Journal of Agricultural Economics, 66(3). 301–13. World Bank, 2014c. Republic of India: Accelerating Agricultural Productivity Growth. Teewari, M., 2014. Framing India’s Urban Turn: Why Is India’s Urbanization Important to India’s Growth and Climate Goals? ICRIER Background Paper. Indian Council for Research on International Economic Relations, New Delhi. Teewari, 2014. Framing India’s Urban Turn: Why Is India’s Urbanization Important to India’s Growth and Climate Goals? Sources for this paragraph include: Bertaud, A. and Brueckner, J., 2005. Analyzing Building Height Restrictions: Predicted Impacts and Welfare Costs. Regional Science and Urban Economics, 35(2). 109–125. Sources in this and the subsequent three paragraphs are: ACCCRN India, 2013. Urbanization – Poverty – Climate Change. A Synthesis Report – India. Mohanty, P.K., Misra, B.M., Goyal, R., Jeromi, P.D., 2007. Municipal Finance in India – An Assessment. Study 26., Department of Economic Analysis and Policy, Reserve Bank of India, Mumbai.